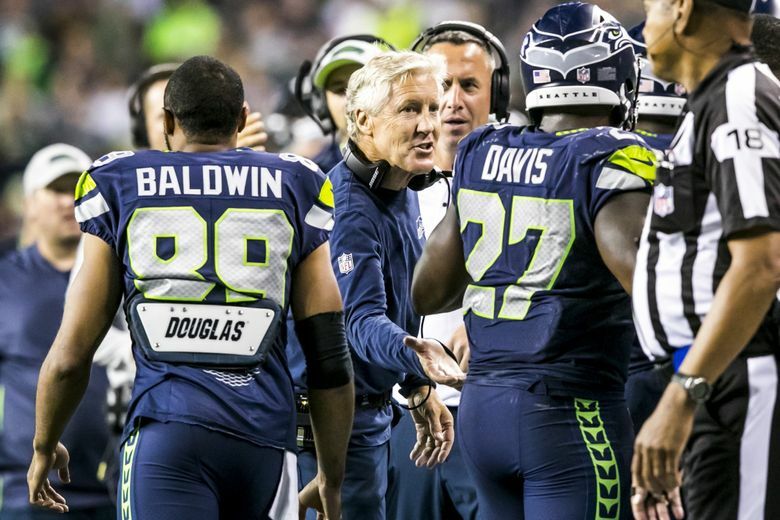 As the Seahawks begin the 2018 season on the road against Denver this Sunday, we take a look at how the national media expects Seattle to fare with a host of new faces, an exciting rookie punter, and a lot of uncertainty. Field Yates picks Russell Wilson to lead the NFL in QBR: “It’s important to note that Total QBR is a statistic in which mobile quarterbacks can make a decided mark. While Wilson may not boast a supporting cast on offense that parallels that of his quarterback peers, he is as nifty and nimble on the run and a tremendous thrower. If Seattle stays in the NFC West hunt, he’ll be in the MVP mix. Peter King picks the Los Angeles Rams over the New England Patriots in Super Bowl LIII. Labor Day 2017: The Rams were trying not to be a laughingstock anymore, with the youngest coach in modern NFL history, a quarterback desperate for a detour from bust-dom, a GM hanging on for dear life, and no one to put on a billboard in a sprawling market that demanded stars. Best two players on this team: a defensive tackle and a punter. King also names Richard Sherman, now a San Francisco 49er, as his No. 4 pick for Comeback Player of the Year. None of the 15 panelists pick the Seahawks to make the playoffs, nor any Seahawks as award winners. Jeremy Bergman: This division is and will be the Rams’ to lose — their roster is superior at nearly every position aside from quarterback and pass rusher — but the West won’t be easily won. The Rams will split their division games en route to the West title and will fail to secure a first-round bye, thanks to late-season losses to late-charging rivals Arizona and San Francisco. … In Seattle, the 12s will be calling for offensive coordinator Brian Schottenheimer’s head by Halloween — and head coach Pete Carroll’s by Christmas. Happy holidays? “At this time a year ago, the Seahawks were still viewed as one of the leading contenders to represent the NFC in the Super Bowl. They were the New England Patriots of the conference—a team that was not only good but consistently so over a period of several years. Seattle won a Super Bowl and should have won a second. Rashaad Penny receives one vote a piece as a dark-horse offensive rookie of the year and as fantasy player of the year. Mike Tanier: “Seahawks offensive coordinator Brian Schottenheimer wants to establish the run, run when teams are expecting the run, run like he’s coaching a 1970s Texas high school team and so on. Does it make good football sense? Heck no! Does it mean boffo fantasy potential for the first-round pick, who also happens to be the only legitimate every-down and goal-line running back on the roster? Heck yes!